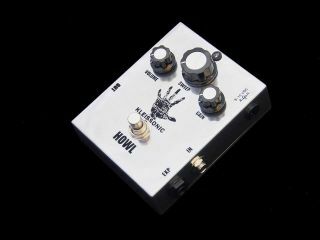 Kleissonic has introduced the Howl, a two-notch phase-shifting pedal. The Howl boasts knobs for Volume, Gain and Sweep, but a “Rate” control is conspicuously absent. There is also no built-in LFO. The Howl works with any expression pedal with minimum 10KOhm and maximum 100KOhm. It can also work up to 250KOhm on demand. Two internal trimpots help the user easily calibrate the feeling of the expression pedal as well as the range of phase frequencies. The Gain control provides up to +10db of ultra-clean boost of the overall sound at the midpoint. From 12 o’clock onwards, it gives more punch to the phase stage. For more information, head over to Kleissonic.com.